(1) Cheap stocks are often overlooked because investors prefer the glamour growth stocks. This is the behavioral argument that says investors prefer a company with a narrative about the future as opposed to one that’s undervalued or beaten down in price. (2) Value stocks compensate you for higher levels of risk because the companies can become distressed. This is more of an efficient market argument that says higher expected risk should lead to higher expected returns. You can argue a case for either reason but Asness concluded that it’s probably a little bit of each. At the end of the day, buying cheap stocks has worked out very well over longer time frames..
Dimensional Fund Advisors (DFA) was using factor investing techniques before the cool kids started calling it smart beta. Based on the research of Eugene Fama and Ken French, who Asness actually studied under for his PhD at the University of Chicago, DFA has been tilting towards value and small cap stocks for a number of years now. But those higher returns can come at a price. Asness actually shared that when he started AQR in 1997 the spread between buying the cheap names and selling the expensive names led to a 60% loss over the next 4 years. 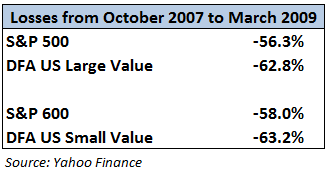 So value investing works, but not all the time. To earn the higher long-term performance numbers will mean dealing with periodic bouts of underperformance. Remember, there’s no free lunch in the markets. Gaining access to DFA funds is a little different than the average mutual fund. You can only invest in DFA funds through qualified fee-only financial advisors (or if they happen to be included in your workplace retirement plan). One of the biggest problems with outperforming strategies is that investor behavior can completely trump those excess gains from buying and selling at the wrong times. So let’s see if DFA’s qualified advisors have helped their investors decrease the behavior gap. The 5 and 15 year behavior gaps are really good while the 10 year is probably affected by the 2008 crash when many investors misbehaved. Unfortunately, nearly 2% of the 10 and 15 year returns have been eaten away by bad investor, or in this case, financial advisor behavior. Investment professionals have more experience, but that doesn’t mean they’re immune to the ups and downs of the markets. Risky investments tend to lead to risky behavior. Value investing is counterintuitive, can lead to large losses and comes with long periods of underperformance. That means the value premium isn’t going away anytime soon. There probably aren’t enough steady hands with the required patience to see value strategies through these cycles. For these reasons a tilt to value strategies as part of any overall diversified portfolio is probably a much safer, less stressful way to implement within your investment plan than trying to hold on for dear life by investing strictly in the value factor. Either way, the process of buying some of your relative underperformers while selling some of your relative outperformers is the most basic form of long-term investing. Good article. In the case of DFA, M*s $ weighted returns are a bit misleading. DFA saw no “advisor bad behavior” or outflow in 2008 – the only fund company I’m aware of that saw inflows in Q3/Q4 2008 and Q1 2009 (see page 2 of this: http://www.equiuspartners.com/admin/includes/resources/nov09ac.pdf). The IRR will not show accurate results for a fund with uneven returns but consistent positive inflows (as DFA has seen, but is rare elsewhere). It will assign all $ the same expected return regardless of when they came in even though of course that’s not possible. For that reason – with DFA – cash flows tell a better story. Also, DFA would actually (and have) fired advisors caught market timing, so any fickleness in fund flows would logically be minimal. Too see the DFA $ weighted return problem in reverse – see DFA US Targeted Value, their other SV fund. It became as/more popular than DFSVX after it’s soft close in 2007, so most new assets starting coming in 2007/2008/2009. It’s 10Yr “investor return” is over 3% higher than fund return – simply a function of pattern of returns relative to cash flows. A good cash-flow example I use is last year on TIPS – a bad year had most investors fleeing. Vanguard TIPS (owned by advisors and DIYers) lost -14B in assets, the second largest net outflow of any bond fund. DFA TIPS, almost identical to Vanguard except only owned by advisors, took in a net 10% increase in assets as a % of beginning year assets – advisors did what you would hope: add to the underperforming asset and have been rewarded (relatively speaking) this year. I suppose it depend on how established a fund is in relation to the flow sizes. I did think it was interesting that the 15 yr number for the LC fund was negative for 10 yrs but flat for 15 yrs. That must have something to do with flows during the crisis I would imagine. There’s not really a great way to accurately gauge the performance of the market over longer time frames against someone dollar cost averging into a fund. Thanks for clarifying. Ben – Great work as usual. One point of clarification: As far as I know, you do not have to be fee-only to access Dimensional funds. They also approve registered reps and broker-dealers. I was out in Austin a couple years ago and was surprised to see several reps at the conference. I asked and Dimensional told me that they don’t require an advisor to be fee-only (or even an RIA) in order to access their funds. It’s a bit disappointing, but the reality is that there are a lot of assets on the brokerage side and they want to grow AUM like everyone else. Gotcha. Didn’t know that. I think it would be interesting to see how much their asset base would grow of they opened up to all investors, especially with the smart beta craze. Obviously what they are doing is working though. Agreed. I know several folks, Rick Ferri being one of them, that have asked Dimensional about launching ETF share classes of their funds. Thus far, I don’t think they’ve been interested in doing so. From what I know, I think the next big area of growth for them will be retirement plan assets. They are making a pretty big push with their Managed DC program. The smart beta craze is an interesting one. Obviously a ton of new products coming on the market. Ignoring the merit (or lackthereof) of the products themselves, the question is: Will investors use them correctly? My guess is no.